Day three was the first day of Max's conference, and the first of two days Parker and I would be on our own in the city! Since we were going to be separated, I was super grateful to have a working phone in case Max needed to reach us or vice versa, and I was also very happy to have GPS for Google Maps so I could navigate around London. Our original itinerary had Parker and me at Kensington palace for their 10AM opening. This is what Parker looked like at 10AM. I really wanted to balance doing "all the things" with keeping our little guy (and my husband and myself) rested and happy, and on this day, I feel like we were still struggling with the time change (except for Max who was at his conference before 8AM). 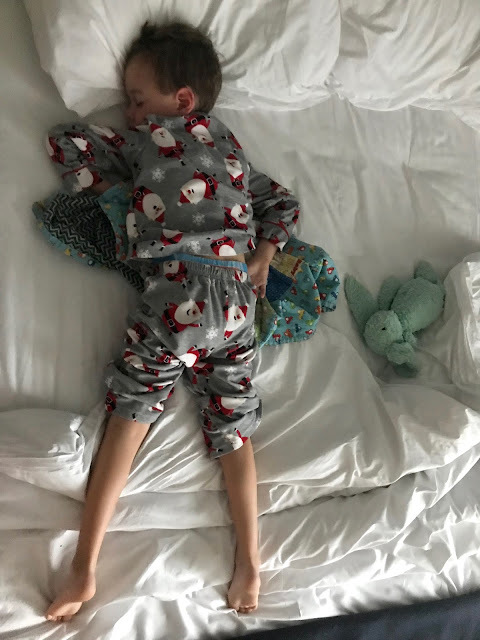 I just didn't have the heart to wake Parker up (and subtly opening the curtains, showering and getting ready didn't do anything to budge him). 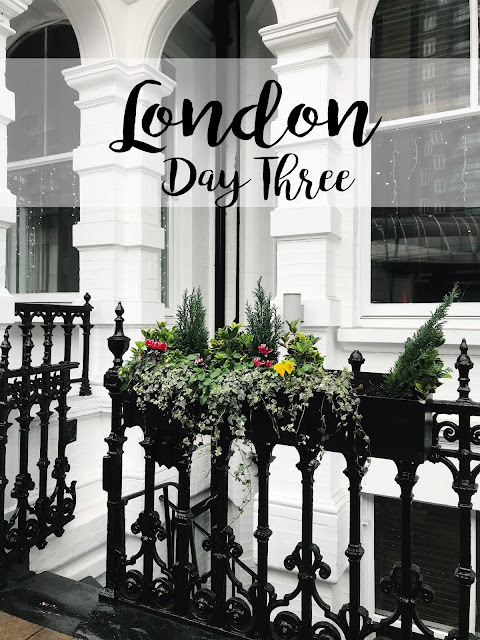 When planning our trip, I tried to give our days a bit of a buffer, so I didn't sweat missing the scheduled palace time, and figured we'd use our Kensington Palace tour tickets later in the day (we actually ended up using them the next day). Instead, we had a slow morning and then popped across the street to the Waitrose (a grocery store) around eleven so Parker could select a cereal and some milk for the rest of the mornings in London (he's very much an "eat right when I wake up" guy, whereas Max and I usually skip breakfast altogether). 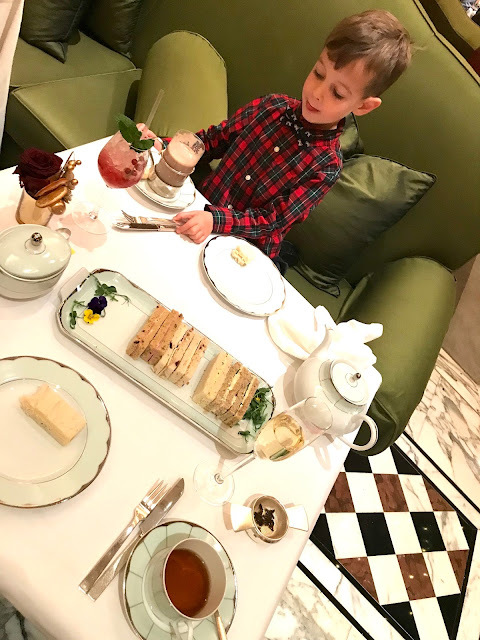 We also stocked up on some snacks, and after putting everything away in the hotel room, it was already time to start heading out for our 1:30PM tea time at The Dorchester! I actually changed into my new waterproof leather knee high riding boots right after we snapped this shot as the light rain had become a steady rain (the boots were all sorts of perfect for lots of walking in the wet and cold). I'm not sure why it didn't even occur to me to get a taxi to tea - of all the times, this would have been the one to do it! I think I just already had the route mapped out in my head, and both our hotel and The Dorchester were very close to the tube stops so we'd have minimal walking. 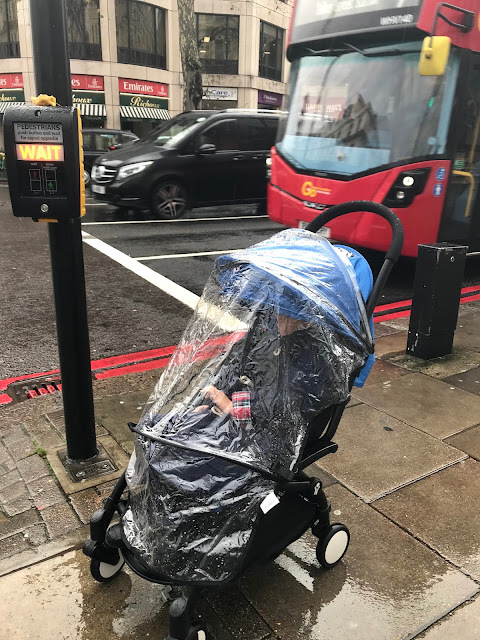 Still, it was raining, and I had no problem wrapping that rain cover over Parker's pram! I'm so thankful the AirTots people threw that in! I said it before - I had always given those covers the side eye, but when the rain is coming down, your first instinct is to protect your little one. This was also my first day doing the whole fold-up and carry of the pram up and down the stairs of The Underground by myself, and I definitely gave myself a mental high five when it all worked out. Over at the Hyde Park stop, the rain had let up, and all Parker wanted to do was watch these stoplights. Before we left the U.S., Max had told Parker about the U.K. stoplights, and how the red lights turn red+yellow before they turn green (to let cars know when it's almost time to go). Parker got a kick out of watching them change at the intersection in front of The Dorchester. Y'all. This tea was seriously one of my very favorite memories from the trip. And while I knew Parker would enjoy it, I was surprised by just how much he did. He fully understood how special it was, and still talks about it. Traditionally the English afternoon tea is a late afternoon snack between lunch and dinner, but we made ours our lunch meal. 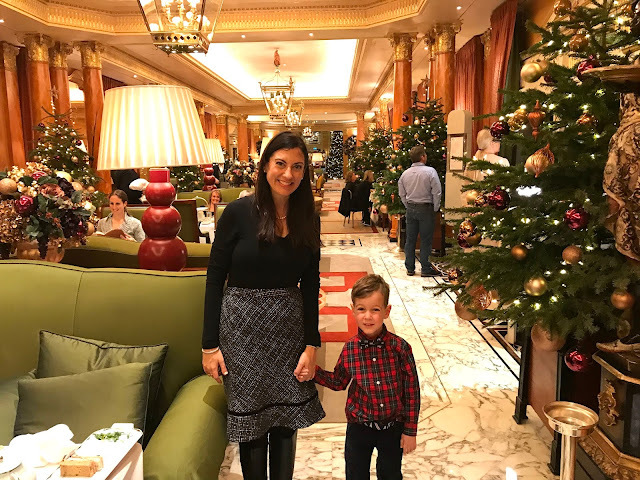 It lasted almost two hours, and from the moment we stepped into the lobby, everyone at The Dorchester was over-the-top gracious, friendly, and accommodating. 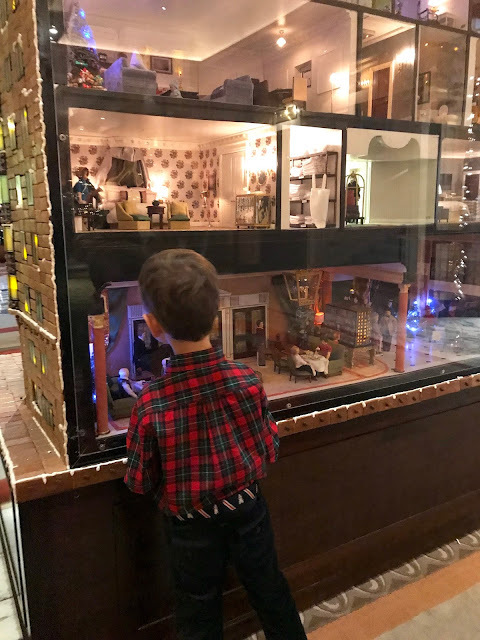 The entire hotel was decked out for Christmas, and Parker beelined for this ginormous gingerbread Dorchester replica. The other side was filled with the most incredibly detailed dollhouse furniture. It was amazing! And our actual tea time? Magical! 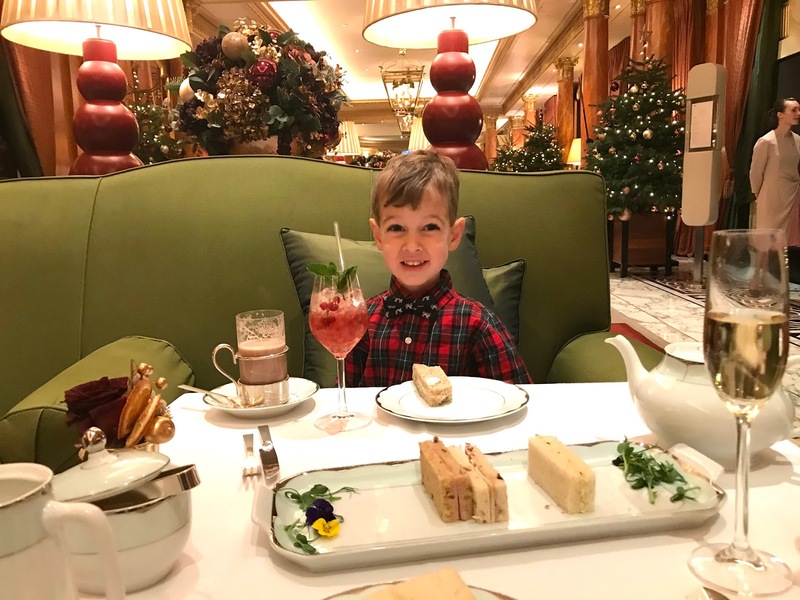 The "Festive Champagne Afternoon Tea" was a set menu intended to be shared. 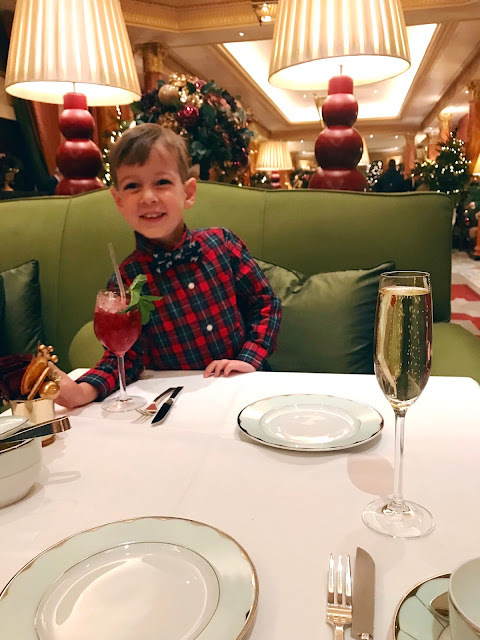 I was brought a glass of champagne first thing, and Parker was given a mocktail called Under the Mistletoe. He thought it was just the best thing ever. When it came time to order tea, I chose the Dorchester Breakfast Blend, while Parker opted for hot chocolate. Next came the finger sandwiches, which were all fantastic. True to form, Parker's favorites were the fanciest ones (the crab, and the truffled egg salad). I really enjoyed the turkey cranberry. After the sandwiches, we moved on to the sweets, starting with plates of scones and then Christmas themed French pastries. We were given tiny mince pies when our bill arrived (we had them wrapped up) and then Parker was encouraged to check out the Candy Shoppe. Yep, The Dorchester had a complimentary candy room for the kids, complete with scoops and bags. You've heard "kid in a candy shop"? I can't even describe how excited this guy was. So by the time we were done in the Candy Shoppe, it was close to 4pm (closing time for Kensington Palace). Parker was asking to go back to our hotel (the jet lag had caught up with him). It was cold and rainy, so the hotel sounded like a nice option to me as well. I snapped this photo right before we ducked into The Underground - I feel every street and building in the area looked something like this. London at Christmas is just magical! Once back in our room, Parker napped (and I think finally caught up on the new schedule). Max returned around 6PM and we had dinner reservations at seven for Khan's of Kensington, an Indian restaurant right by the South Kensington tube stop (and a ten minute walk from our hotel, which was off the Gloucester Road stop). It was technically a business dinner, and I didn't know the protocol so I didn't snap any photos, but I did get to meet a former colleague of Max's whom he worked with in the U.K. for an extended period several years back. It was so much fun dining with Brits; I could have listened to their accents all night! And I feel like I'm always so surprised by how much they know about what's happening in the U.S. Over the course of our trip, we were asked about the Alabama special election that had just happened from three different groups - I most definitely do not follow British politics that closely. Our dinner that night lasted, I kid you not, almost four hours. When we walked in at seven, the place was almost empty, but by 10PM every single seat was filled and it was hopping! It really is a later dinner scene there! We walked back to the hotel through the darling Kensington streets with bellies full of Lamb Rogan Josh, Saag Paneer, Naan, and Chicken Tikka Masala. Another wonderful day in London! I am really enjoying hearing about your trip! It makes me want to visit England. Wow. My favorite thing in London was the high tea as well. Such a great experience. And for Parker to go into the candy store...free. So cool. What a great experience!